Preheat oven to 375 degrees. Cut the two squash into halves and scrape out the seeds. Place cut-side down in a glass dish with 1/2 inch of water. Bake for 30 minutes, or until squash is tender. Meanwhile, heat oil in a large nonstick skillet; add onion and chicken breast. Cook over medium heat, stirring every few minutes, for 8 minutes or until chicken is cooked through. Add pear, mushrooms, walnuts and seasonings. Cover skillet with a lid and turn heat to low. Cook for 5 minutes, then turn off heat. 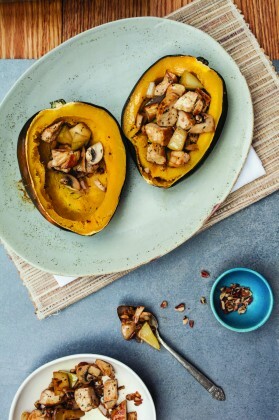 When the squash is finished baking, stuff each half with the chicken-and-pear filling.